Property Size 1,179 sq. ft.
Come to our beach and enjoy this condo on Holiday Isle with huge balcony, new patio furniture and great gulf views! 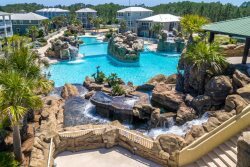 The Aegean is centrally located close to shopping and restaurants in Destin. It has a wonderful pool with barbecue grills, private deeded beach, and plenty of parking. The condo has its own private, 200 square foot balcony that overlooks the pool with slight gulf views. Its the perfect area to have your morning coffee or watch the sunset. Add $110 for housekeeping and 11% for tax. There is a $69 damage protection fee, $30 Booking Fee, and 2.5% to process credit card payments. A credit card on file and 25% down will hold the unit for you.